Gaura lindheimeri "Siskiyou Pink" having a bad hair day. So I have to confess that today was somewhat of a low-point in the garden for me. It was just yesterday that I was jazzed about the good results in the seed-starting experiment. 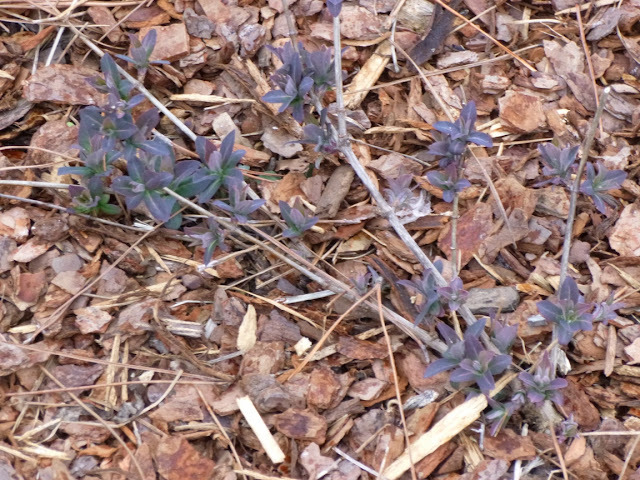 Eager to maintain forward momentum in the garden, I decided to prune back two of the Gaura Siskiyou Pinks, a task that I had been avoiding for far too long. Some sources recommend pruning back gauras in early winter, but others suggest leaving the task until early spring. I probably should have done it at least a month ago, but spring here has been so cold and wet that I didn't really feel like it. The same gaura after a trim. Not much prettier. You can see what looks like a little bit of fresh green growth. That's actually better than the other neighboring gaura I cut back where nearly the whole plant looks dead. So I went out after an early dinner all bundled up in my winter coat, temps in the high 40s F (~9 C) and a light rain falling. 1. The gaura looked dreadful. Sure, I had tried to fool myself for the last few months that the curled and frizzed gaura stems gave the garden 'winter interest'. But really, they just looked dead. 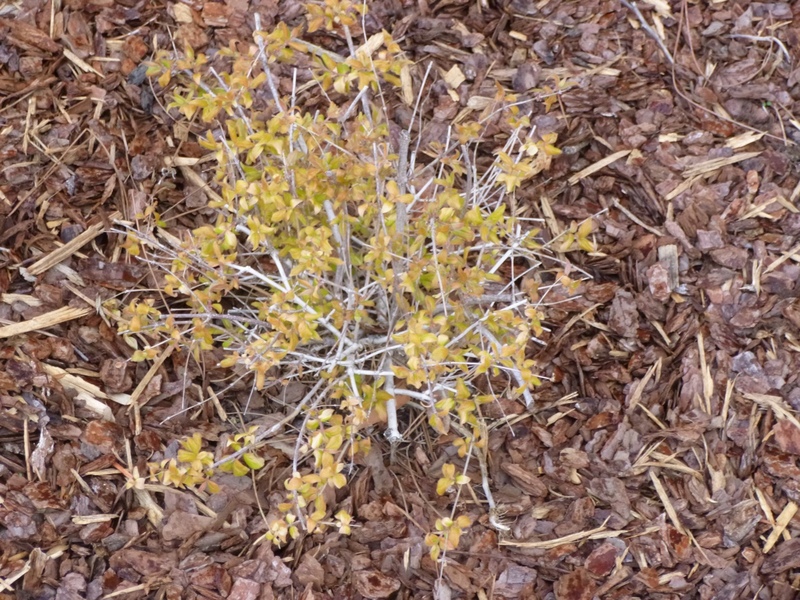 And when I cut away the old stems (never quite sure how far down to prune the gaura), I found barely any new growth on one of the gauras and only a moderate amount of new growth on the other. Now gauras are supposed to be long-lived in light soils with good drainage, but I'm thinking that a winter with above average rainfall in our heavy clay soil may have done them in. It's frustrating because it wasn't long ago that I was singing the praises of gaura, and now I feel like this is another plant that I have to re-evaluate as to whether I really want in the garden. Sure it looks pretty while it flowers in the spring, and perhaps it gives a brief rebloom in the autumn, but once hot temperatures kick in, gaura stops flowering, it looks fairly awful in winter if not trimmed back (could perhaps solve that last bit by trimming it in late autumn) and it may not survive more than 2-3 years in our climate and soil. 2. Here we are in early April and many of the plants are still leafless and bare. I guess I was spoiled by last year's early spring, but the unseasonably (10-20 degrees below average) cold temperatures this year have me yearning for some greenery. And it doesn't help that a number of my plants - Chase Tree (Vitex agnus-castus), crape myrtle, Rose of Sharon - are living up to their reputation as being slow to leaf out. 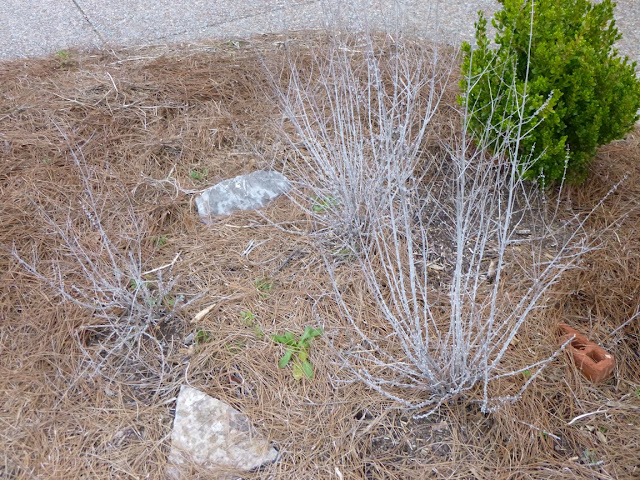 Actually, I knew that crape myrtle would be slow to leaf out. When we bought our house two years ago, the crape myrtles were totally bare and we actually contemplate cutting them down because we didn't like the look of the bare branches. Then the summer flowers came and I was so glad we had decided to keep them. I hope I'll be singing a different tune later this month or certainly by May, but right now I sort of wish that I had added more plants to my landscape like the Beauty Bush which started leafing out last month and now looks fairly decently clothed in leaves. Why couldn't I have planted more deciduous plants that leaf out relatively early - like this Beauty Bush? 3. Evergreens or semi-evergreens make me happy. Again, this is something I've just realized this winter. And I don't have a lot of evergreens. 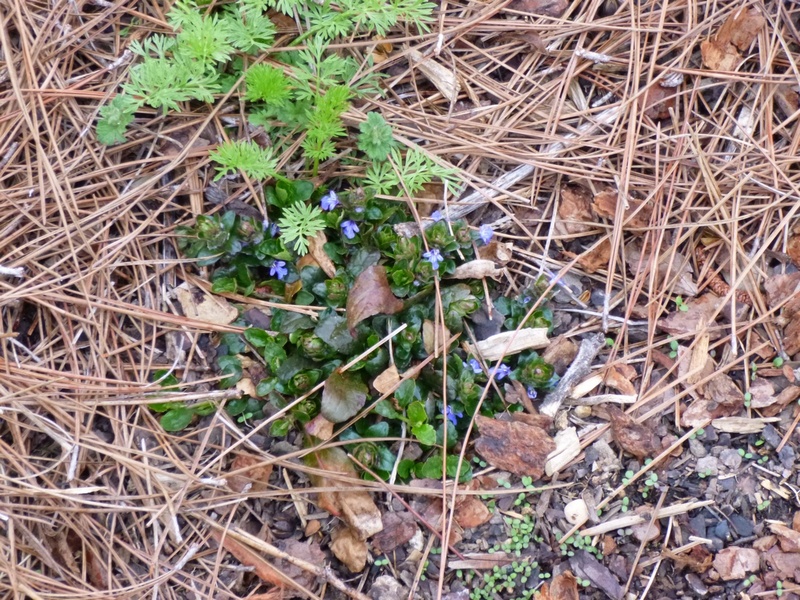 I'm not talking about conifers - at least not necessarily - but plants like Lonicera sempervivens (native coral honeysuckle) or even the oak leaf hydrangea and sweet woodruff, which look tattered and ragged, but kept a lot of their leaves over the winter and are already sprouting plenty of new growth. I'm also loving the new growth on the three little Aronia plants, but there's nary a bud or leaf in sight on the tiny Calycanthus floridus. I'm wondering if it even survived the winter after a rough first year last year. If I don't see any sign of life in a week or two, I may rip it out and replace it with something that's more than 3-inches tall. Same deal with the Sarcococca confusa. I planted two Sarcococcas last year - one died and the other hung on, but it's not looking good (some leaves yellow, others damaged) and doesn't seem to have any new growth. Perhaps I should cut my losses with that one too rather than doting over a damaged and stunted plant for the next year or two? 4. 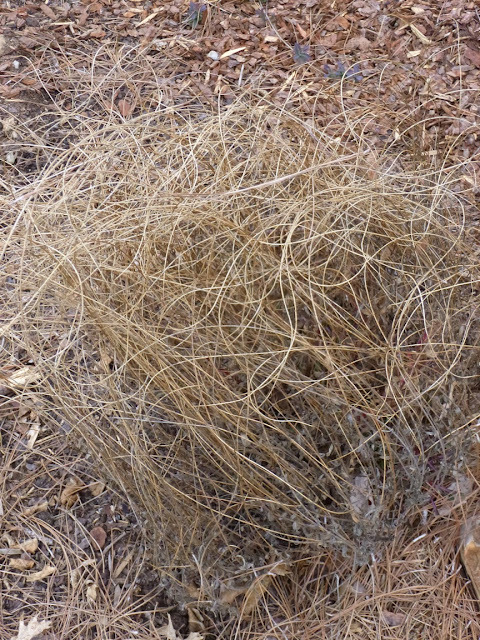 Still kicking myself about the pine straw. 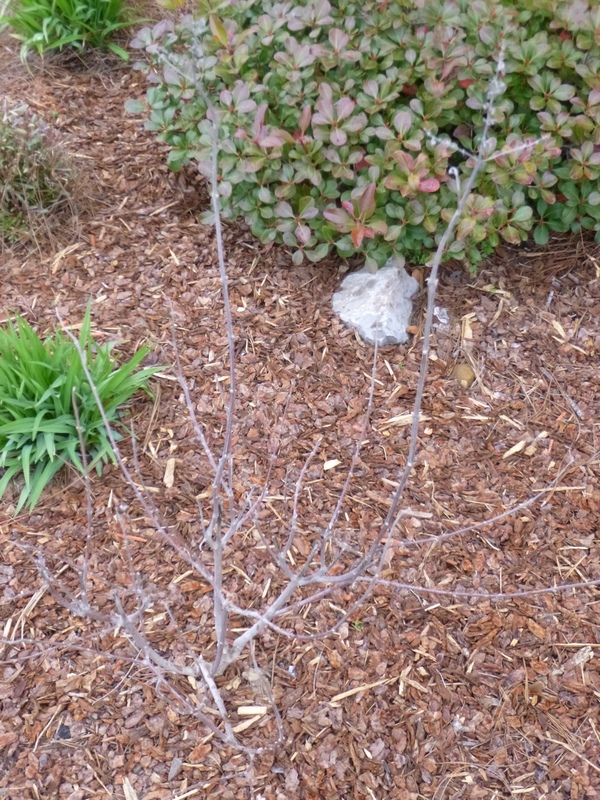 I've found that I much prefer the pine bark nuggets, but right now I have a mix of areas mulched with straw, areas mulched with nuggets and unmulched areas. Not happy at all with how that looks. 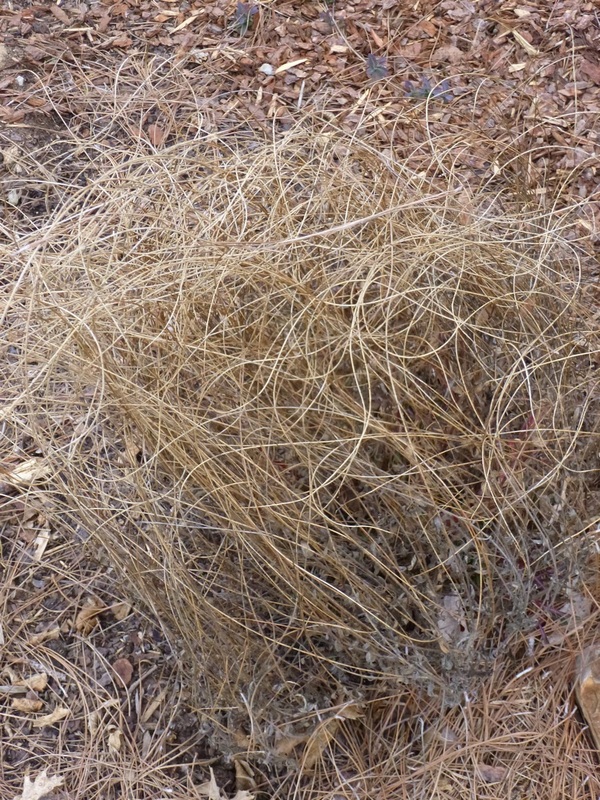 Plus there are plenty of weeds in the straw, since they're difficult to pull there. (Some weeds in the nuggets too, but I find I have a much easier time getting those out.) In some cases I've laid the nuggets on top of the pine straw, but mainly I'm trying to move the straw and replace with nuggets. But it's getting hard to find places to put the straw. I hate feeling like I made work for myself unnecessarily, but that's exactly what I did twice over - first when I laid the straw and now when I've had to pull it up and move it. Double sigh. Anyway, don't mean to complain, just feeling a little down on myself for making what feels like stupid gardening mistakes. Have to keep reminding myself that gardening (like anything else) has a learning curve and I'm still on the steep part of that slope. I also know that it's OK to make mistakes - hopefully I just won't make the same mistake twice (or more often than that). And I know that there are also plenty of hopeful signs - the rapidly spreading and thriving Sweet Woodruff, all the plants that are leafing out nicely, the David garden phlox that is springing up and seems to have multiplied, Stargazer lilies starting to poke through the soil. And there are the happy surprises, plants that I had given up for dead that are coming back to life - a clematis, a Lonicera Serotina honeysuckle, the ballon flower (Platycodon) and a variegated Anise Hyssop. I'm sure there will be many other joyful moments in the 2013 gardening season, but today was a tough one. Do you ever have days when you beat yourself up over gardening decisions? And what do you do to pull yourself out of that funk? I'll close on a happy note. 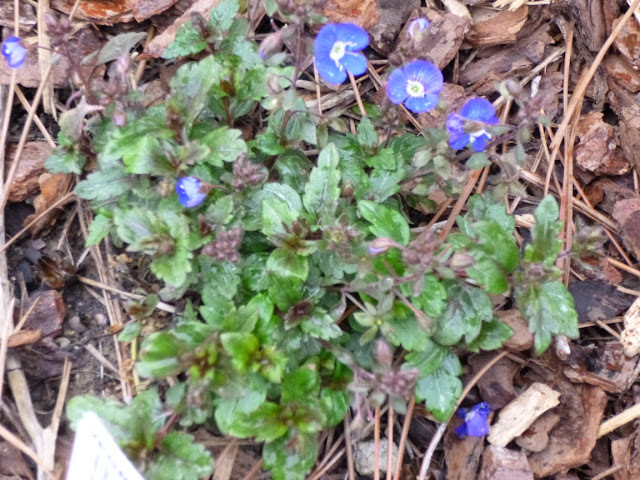 This plant looked so awful last year that I contemplated tearing it out. I thought our extreme summer temperatures last year had killed it, but apparently it is tougher than it looked. You're looking at Lonicera periclymenum, a type of honeysuckle also known as Woodbine. This is a variety called "Serotina" that is supposed to have fragrant flowers and red berries. I'm digging the foliage, which I would call purplish, but Missouri Botanical Garden calls dark green above and bluish green below. I probably should have given it more shade than it has in its current spot. (Mobot says it can take full sun to partial shade, but prefers partial shade.) Supposedly it can grow to 10-20 feet long and may attract hummingbirds. Hope springs eternal!! Oh, the agonies of spring inventory -- what is coming back and what isn't -- it can be frustrating. 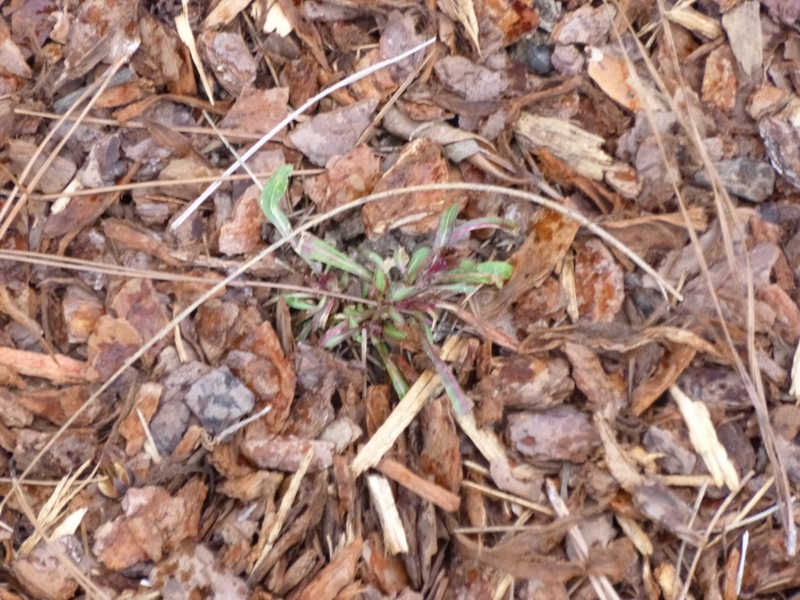 Gaura for me (Connecticut zone 5/6, wet winters) is very iffy. I have lost so many, and then sometimes they come back, but not reliably. I put them in big pots one year, brought the pots into the garage for winter and barely watered all winter, and they did great, completely leafing out in early April and blooming all summer. I do think wet winters and snowmelt are the culprits, for gauras and for Russian sage too, even if you have them in sandy soil. I think everything looks good. Spring has just not fully sprung yet. My gaura looked exactly like yours when I trimmed it a few weeks ago. Temps here are now in the 70's most days, and mine has grown by leaps and bounds after her haircut. I think yours will, too. My Vitex still doesn't have any leaves on it - neither do my crape myrtles, but they are worth it when they do finally decide to put on a show. Congrats on the new baby gaura! How exciting! Thanks for the encouragement, Laurrie :) Today is a bright and sunny day, so things are looking up already. Your idea of potting the gaura up in the garage to overwinter them is intriguing. I'll have to consider that. 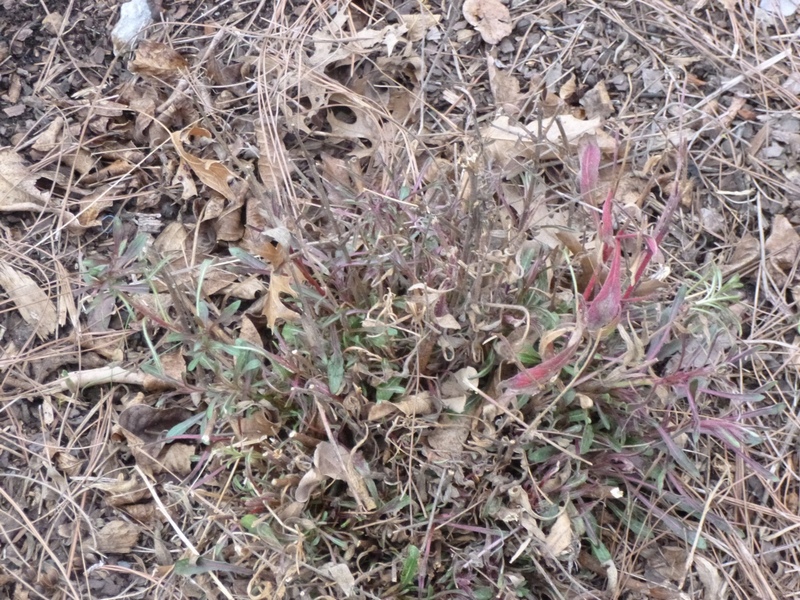 @HolleyGarden, you're giving me hope that my gaura will in fact bounce back! I was down in Houston last weekend and saw that the crape myrtles were just leafing out there - and it was 89 degrees! So I guess I have a while to wait yet to see Crape Myrtle leaves here in Tennessee. In your experience, does Vitex leaf out the same time as the Crapes? Gosh, I've been gardening most of my life and I'm still learning. It's refreshing to hear your honesty, but don't be too hard on yourself. The mistakes and learning are the fun of gardening--it's like one big experiment. And you get to decide the components! I'll bet the Guara will come back very soon! Most days I let the mistakes roll right off my back like water off a duck. But certain days - especially cold, grey and rainy/sleety days in early April, I guess I let the mistakes get me down. It's sunny today with a big warm up forecast for the weekend. Looking forward to the annual plant sale at our Perennial Plant Society and hoping to plant lots of new perennials and turn over a new leaf in the garden!